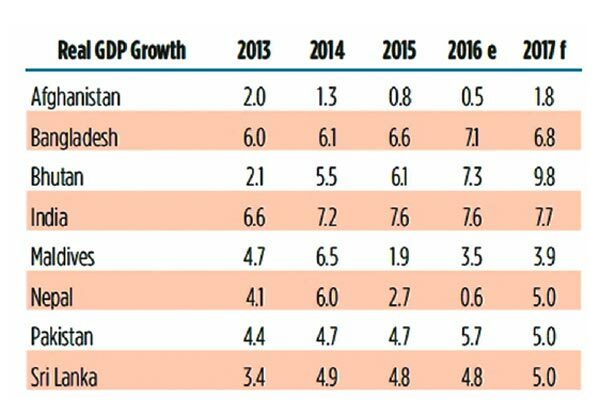 South Asia has defied a sluggish world economy and solidified its lead as the fastest growing region in the world in 2016, a new World Bank report said yesterday. Led by solid performance in India, economic growth is expected to gradually accelerate from 7.1 percent in 2016 to 7.3 percent in 2017. Given its weight in the region, India sets the pace for South Asia as a whole. Its economic activity is expected to accelerate to 7.7 percent in 2017, after maintaining a solid 7.6 percent in 2016. This performance is based on solid growth contributions from consumption - boosted by normal monsoon and civil service pay revisions. Over the medium term, accelerated infrastructure spending and a better investment climate may help increase private investment and exports.